In the picture above, the shading strategy (vertical fins, horizontal slabs, covered courtyards) has been determined by developing a building model to predict the shading that will be provided by each of the strategies. External shading is orientation specific and can be effectively integrated into the building envelope if designed keep this factor in mind. Structural controls like ‘external shading devices’ are essential environmental controls that either obviate or greatly reduce the need for mechanical heating and cooling to maintain thermal comfort inside buildings, by controlling heat gain through openings. Along with glazing type and size of the fenestration, shading devices are equally important in limiting heat gain from outside through radiation. External and internal shading devices can thus be used as an essential solution for achieving energy efficiency. Efficacy of internal shading devices is limited as they absorb the heat once it has been transmitted inside the space and heat up themselves. This can lead to higher mean radiant temperatures inside the building. Orientation of an opening and by extension, solar radiation incident on it, is the single most important factor in the design of its external shading devices. Impact of seasonal variation in the sun path (and incident solar radiation) is linked to the orientation. Sun path is at a low angle and, slightly to the south of east and west during the winter season in northern hemisphere. In summer, sun path is at a high angle and, to the north of east and west. So shading for south openings in the south must allow penetration of the low angle sun for heat gain during winter but must block the same during summer. For opening in north, shading is needed only to prevent penetration of the high sun angle during summers. Solar radiation on east and west facing openings does not vary much by the seasonal variations in the sun path. They receive uniform solar radiation, while compared to north and south facing openings, which receive higher solar radiation through the year. As a first step towards shading, longer sides of a building should be oriented North- South which is preferred to minimize overall solar gain through the envelope. South-facing windows are the easiest to shade. Overhangs on south-oriented windows provide effective shading by blocking summer sun and admitting winter sun. Use fixed horizontal overhangs on south-facing glass. 1m shading device can reduce cooling loads substantially. To the greatest extent possible, limit the amount of east and west glass (minimize window area) since they are harder to shade. Consider the use of landscaping to shade east and west exposures. Shading is generally not required at the north side. Only cutting the low evening summer sun can be achieved by vertical shades or internal blinds. Semi-outdoor spaces such as balconies (2.5m – 3m deep) can provide shade and protect interior spaces from overheating and climatic variations. At the same time they act as wind scoops and provide a private social space for the unit. To enhance natural light utilization, passive design strategies such as light shelves are very useful for deeper and uniform distribution of light (most effective on the south side of the buildings, mostly recommended in mild climates and not for tropical or desert climate). Windows, E. “Measuring Performance: Solar Heat Gain Coefficient (SHGC).” from http://www.efficientwindows.org. DeKay, M. and G. Brown (2013). Sun, wind, and light: Architectural design strategies, John Wiley & Sons. CK Tang, N. C. “BSEEP Passive Design Guidebook “. Wiki, E. C. “Solar Control”. Low-E Glazing Design Guideby Johnson, Timothy E. Boston: Butterworth Architecture, 1991.—An excellent discussion of high-performance glazing’s and their specifications including shading coefficients. Solar Control and Shading Devicesby Olgyay, Aladar and Olgyay, Victor. Princeton, New Jersey: Princeton University Press, 1957.—the classic source for information and examples of sun control and shading devices. Franco, I.M. (2007). Efficacy of light shelves: passive, dynamic, and automatic devices related to light and thermal behavior. Autodesk Ecotect analysis is a sustainable design analysis software as a concept to detail sustainable building design tool. A ray-tracing program that accurately predicts light levels and produces photo realistic images of architectural space in all sky conditions. Shading can reduce solar gains on the building facade. 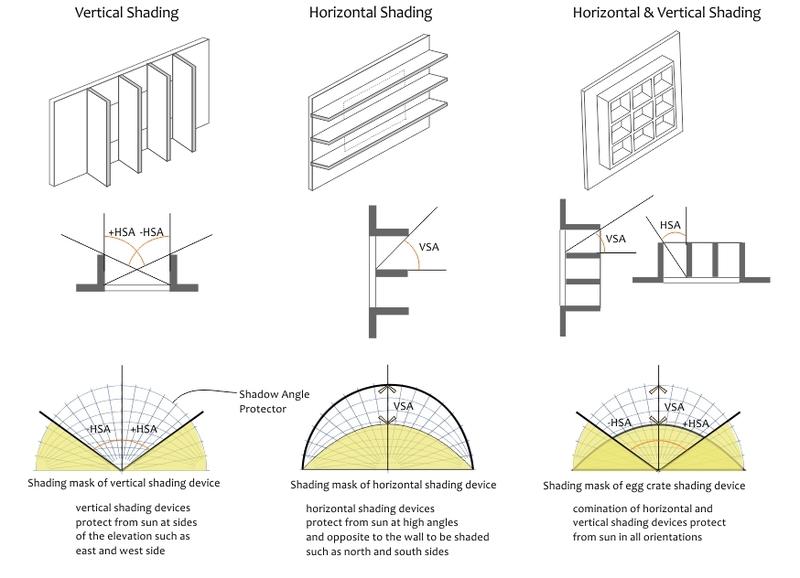 Effective shading strategies for and NZEB should aim at virtually preventing any direct solar radiation from entering the building, especially during the summer months. Shading reduces the effective solar heat gain coefficient (SHGC) of the glazing. This means that a cheaper glass with high SHGC can be used instead of high cost, low SHGC glass. Shading also helps in reducing glare through the windows. Users tend to pull down interior shade if there is direct solar radiation on the glass, this negates all the benefits of daylighting. 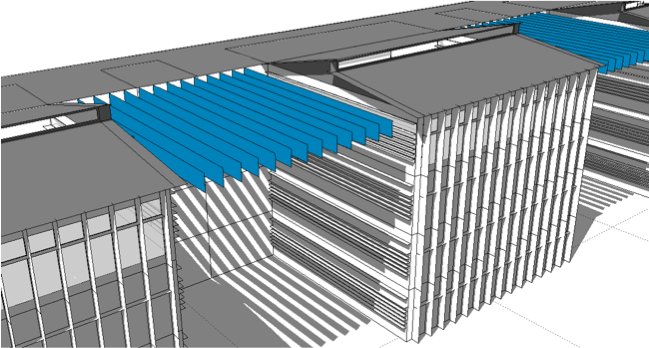 Shading helps ensure glare-free daylight in the buildings.